Oh gosh! I missed giving you a recipe last week for National Cookie Month. So sorry!! 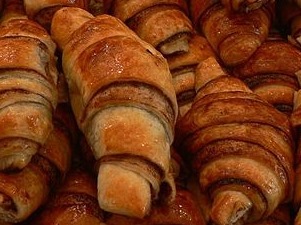 But I’ll make it up to you by sharing my family’s favorite cookie for the holidays, a Jewish bite-sized pastry called, Rugelach. If you’ve never had it – just think of butter, cinnamon and flaky crust. It’s like eating apple pie without the apples. So, so yummy. My recipe has been adapted from the Women’s Day Collector’s Cookbook in the November 1995 issue of the magazine. First is the pastry: In a large bowl, beat the butter, cream cheese and salt until smooth. Turn the mixer to low and beat in flour. Next is the baking: Preheat oven to 350 degrees. Make the filling by melting the stick of butter and combining the cinnamon and sugar. Tape waxed or parchment paper to your counter (or weight down the four ends). Flour the paper, then roll one of the disks into a 10-inch circle. Brush with enough melted butter to coat the circle. Sprinkle evenly with cinnamon sugar. Using a pizza cutter, divide the circle into 12 wedges. Roll up from the wide edge to the point, bend into a crescent shape. Place 2 inches apart on an ungreased cookie sheet and bake on bottom rack of oven..
After baking for fifteen minutes, move cookie sheet to top rack. Bake for another ten minutes or until golden brown. Immediately transfer to a wire rack, brush with melted butter and sprinkle with cinnamon sugar then let cool. This makes about 48 cookies. Happy Baking!!! And if you make this – please tell me how it turns out.